Before starting this review I must first say I will try to limit any spoilers. It is not my intent to give away the story, but I will probably offer more detail than I have in other reviews. So consider yourself warned. 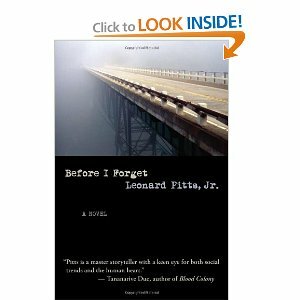 We’ve all heard the old adage “like father like son” and at first glimpse that seems to be the message in “Before I Forget” by Leonard Pitts, Jr. Pitts uses different points of view to tell the story of the three James Moses Johnsons, each dealing with his own dilemma and less than perfect father-son relationship. We start out with the “junior” of the bunch, Mo Johnson, an aging 70’s soul singer who is confronted with a medical condition that forces him to re-evaluate his life. If this was not enough to deal with, Mo learns five days later that his 19 year-old son Trey, is in trouble with the law. While not estranged from young Trey, Mo has not been the model father or a regular presence in the young man’s life. As if all of this drama was not enough, Mo also learns that his estranged father, Jack, is also suffering from a serious medical condition. All of this conflict happens within the first 75 pages of “Before I Forget” which definitely piques the interest of the reader and will keep you reading. Set between Baltimore and Los Angeles, the remaining 280 or so pages takes Mo and Trey on a cross country drive and a better understanding of one another. Along the way an old would is healed, but the story does not end there. To offer depth to this story, Pitts introduces secondary characters and story lines that instead of taking away from the story had flavor, and substance. The underlying story of absentee fathers was presented in a light that is rarely seen – the father’s perspective. Although the reasons noted are not all forgiving, you are at least given a glimpse into the inner workings of some young fathers. “Before I Forget” is a well written story with a number of intermingled story lines that work very well together. I really enjoyed the character development and the realism exhibited in this work. I would highly recommend this book. Previous Previous post: Service with a smile – Please! ?